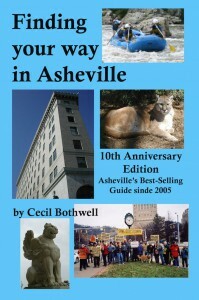 In 2005 I published Finding Your Way in Asheville – a guide to my city. Though this is more than a guidebook, with stories about the cultural and natural history of this town. Tales of the children of wealth who built this town (“Daddy’s Money”), the origins of NASCAR (“Trading Paint”), Black Asheville (“Afro History”), and, of course, The Giant Crystal Under the City.